"With the intensity of a page-turner, the veracity of poetic justice, and the humanity of an epic struggle between good-and-evil, “Kinyamaswa” delivers a terrific literary journey. Highly recommended!" The Columbia Review. Told in verse and prose, “Kinyamaswa: An Epic Poem” by Andreas Morgner is a story set against the experiences of several refugees, beginning with the horrors of Rwanda’s genocidal war and its aftershocks. looked at him with haunted eyes. exhaled a wisp of smoke. a woman lying next to Father Pierre. for the first time, so many, by my own hand. 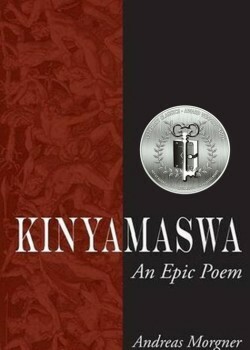 While not for the fainthearted reader, “Kinyamaswa” is at once explicit, bloody, and understated. The violence is depicted without shrill or exaggeration, which makes the work that much stronger. The relationships that develop among the group are portrayed with credibility, tenderness, and sensitivity; fear and animosity contrast with compassion and love. By deploying the dramatic effects of storytelling with the artistic tools of the lyrical medium, the author excels in transporting the reader to a strange, fascinating, terrifying, and ultimately redeeming world that actually existed at a time and place not so far away. With the intensity of a page-turner, the veracity of poetic justice, and the humanity of an epic struggle between good-and-evil, “Kinyamaswa” delivers a terrific literary journey. Highly recommended!